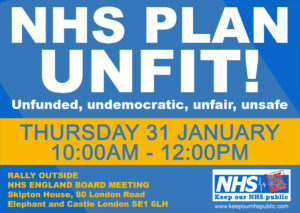 Join us to protest against the Unfunded, undemocratic, unfair, unsafe plan, please share the Facebook event here. 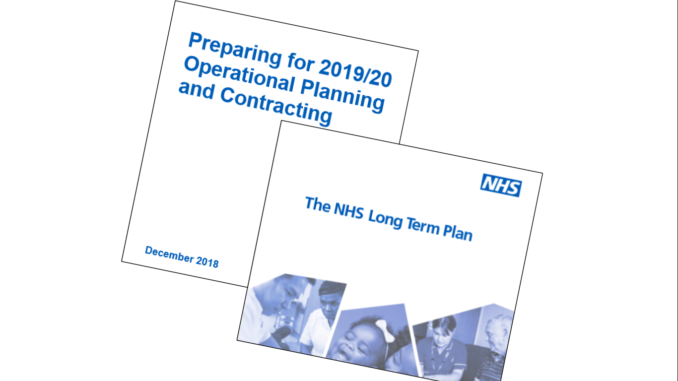 It’s tempting to dismiss the NHS Long Term Plan, published on January 7 by NHS England , as an unrealistic wish list of developments completely divorced from the real constraints on resources. But it demands close analysis. There may be some messages that cannot be dismissed but they distract from the meat of the Plan. What is shocking is the virtual absence of discussion and proposals to address the severe problems facing the NHS. 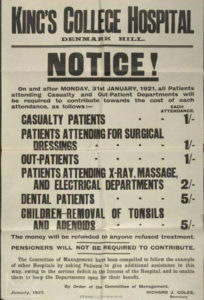 The major restructuring of the NHS goes forward at pace. The Plan, and its preceding Operational Planning and Contracting document, published on December 21, concede that they are incomplete: no workforce plan has yet been published, and there is no evidence to suggest that work on this has advanced at all; the “framework for implementation” is promised for “spring” – presumably spring 2019. None of these new structures will be in any way accountable to the local people and communities they cover. Each ‘integrated care system’ (ICS) would work towards an ‘Integrated Provider Contract’ – along the lines proposed by NHS England and opposed by many campaigners in the consultation that ended last October: as was the case then, there is no guarantee that these contracts could not be awarded to or sub-contracted to the private sector. The plan also requires more forced mergers of the existing Clinical Commissioning Groups to reduce to just one CCG per ‘integrated care system’ (ICS) – ensuring that current CCGs would be reduced to rump bodies with residual token power, accountable to nobody. CCGs are required to cut their management costs by another 20%. Trusts, too, would be required to collaborate with the wider ICSs. Following along the model of the STPs that were hatched up in secret in 2016, none of these changes would be subject to consultation with staff or the public. To add to further misery for many patients, GPs will be required to sign up to new “network contracts” covering populations of between 30,000 and 50,000, meaning that more local GP surgeries will be forced to close with services lumped together in centralised “hubs” offering less personalised and less continuity of care at longer distance for many patients – again with no prior public consultation or consent. This could see the 7500 practices cut back to 1500. There is an implicit threat of privatisation in the proposals for huge new pathology networks and imaging networks to be established with no NHS capital available for investment. Trusts must also aim to increase the funds they get from charging patients for treatment – “overseas visitor cost recovery” – raising little money in relative terms, but deterring some patients from accessing the services they need. This policy undermines the principles and values of the NHS, and is opposed by medical Royal Colleges. In December the Health Service Journal, revealed that NHS Improvement is applying pressure to trusts to seek one-off savings (including a fire sale of “surplus” land and buildings) to help them get closer to, or even lower the “control totals” which limit the level of their deficits. NHS Improvement has offered trusts a controversial incentive of £2 from ‘Sustainability Funds’ for every £1 reduction to their control total this year. There is a decisive move to tighten up trust and CCG finances, with the aim of eliminating all deficits by 2023/24: the mid-year estimate was that trusts were £1.2 billion in deficit, in addition to long term borrowing from the NHS (bail-out funds) now at almost £12 billion. Almost half of all acute trusts have refused to accept their control totals because of the scale of cutbacks required, while others are struggling to comply with theirs. The LTP now says the 30 most indebted trusts are also to be subjected to an “accelerated turnaround process”. The December document made clear that CCGs with “longer standing and/or larger cumulative deficits will be set a more accelerated recovery trajectory,” while many would in any event be forcibly merged with others in the drive to establish Integrated Care Systems within two years. For CCGs and providers alike, those with the toughest problems, and often with the most inadequate resources, face the hardest targets and the harshest treatment. This imposition of centralised control is the more worrying when coupled with the sweeping changes that are proposed to the type of care provided. 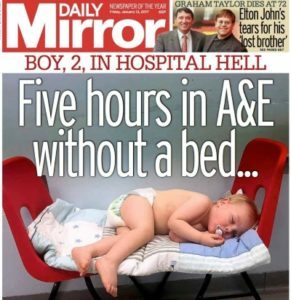 There are proposals for a third type of emergency care, alongside Urgent Treatment Centres and the existing Emergency Departments: a poorly-defined system of “Same Day Emergency Care” is supposed to be rolled out to every hospital with a full A&E, aiming to discharge patients on the day of attendance. However it further fragments an already highly stressed service and requires significant investment in expanded diagnostic services: and there is no guarantee in the LTP that patients would get anything other than “assessment” before being packed off home to cut back community health and social care services. NHS England is also embarking on a mission to cut out a third of outpatient appointments (30 million fewer), on a series of questionable assumptions and citing only the medical specialties without addressing the needs of surgical patients. Sweeping changes are proposed for how to access GP services: patients will be given a new “right” to switch from their existing GP to a “digital first provider” and all patients in England will be offered access to online or video consultations by 2023. There is no corresponding right to insist on a face to face consultation. Unfortunately, this ignores recent research that showed Skype-type online consultations are suitable for only small minority (2-22%) of hospital outpatients, with many clinics finding them completely impractical. The NHS Plan insists on a vision that few patients would find attractive. So despite the jolly phrases and the misplaced optimism of its tone the Long Term Plan is a medium term threat to the services we all depend upon and to our ability to fight locally to defend the services we need. NHS England oversees the budget, planning, delivery and day-to-day operation of the commissioning side of the NHS in England as set out in the Health and Social Care Act 2012. It is now merging with the regulator, NHS Improvement. Don’t agree with your demand to stop charging overseas visitors. NHS needs all the money it can get. Thanks Danny for your comment. The truth is that the amount of money in question is around £70 million out of a budget of some £125 billion. The cost of setting up the charging mechanisms and workforce to ensure the imposed charging is carried through more or less negates the impact. However, a negative regime is put in place, challenging people’s right to treatment and frightening many people who need help into delaying seeking help or avoiding it entirely. 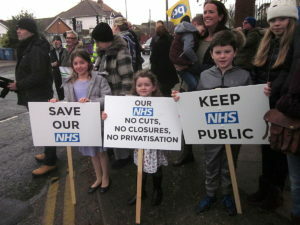 Please have a look at our leaflet on this subject: https://keepournhspublic.com/wp-content/uploads/2018/11/Health-Tourism-facts.pdf. Bevan saw the principles of the NHS as an advertisement to the world for what a progressive society could achieve in providing an excellent health service for all. He felt that was worth it, rather than regimes of checks and charges.